The drill bit is an underrated piece of tool. Side Note use this everyday object to create a rather eye catching piece of wearable accessory that we otherwise wouldn't have glanced, at let alone twice. And most definitely not with such awe and intrigue. 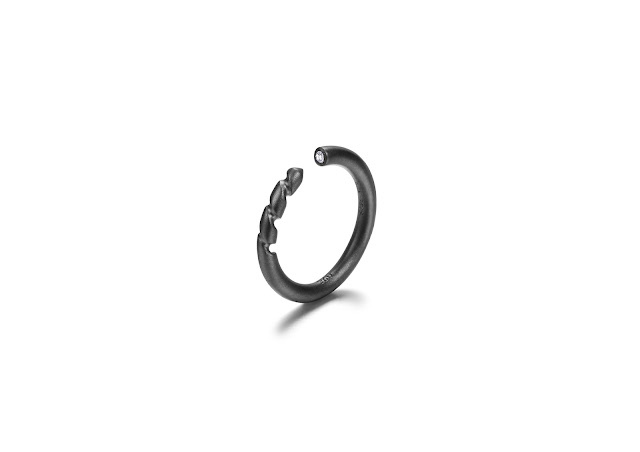 The Mini Drill Bit ring is small yet its power is often underestimated in terms of the damage it can inflict on the strongest of materials such as diamonds and steel. Side Note likened the drill bit to a human being; as it inches forward it creates a breakthrough. We are constantly jumping over hurdles and encountering barriers, but with each leap we become stronger and more determined. The drill bit symbolises the inevitability of life with its infinite twists and turns. Labels: Contemporary jewellery, Independent Jewellery Designer, Ring, Rock it!